The best and scariest vampire movies in horror film history. 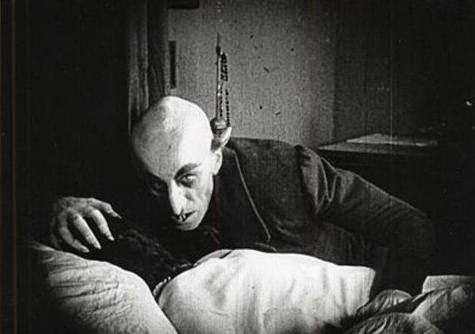 From Dracula to Nosferatu, and more. The vampire films with the most bite. 1 - The Lost Boys (1987) Sam (Corey Haim) and the Frog Bros take on a gang of vampires that have taken over Santa Carlo. Brilliant screenplay with a pinch of dark humor. 2 - Dracula (1931) The classic original is still the best story, atmosphere and direction. 3 - John Carpenter's Vampires (1998) No one makes horror movies like John Carpenter. His work stands above the crowd, and this film really has bite to it. 5 - Fright Night (1985) The original (not the remake) is an enjoyable action/horror film. Two guys move in next door to a high school kid, who suspects it is a vampire and his guardian. The kid gets help from a horror show actor, and they take on the unholy creature of the night. 6 - Last Man on Earth (1964) post-apocalyptic movie in which a virus has turned everyone into vampires. Vincent Price is the sole human scientist trying to find a cure and fight them off simultaneously. 7 - Let the Right One In (2008) creepy Swedish vampire love story. 8 - Thirst (2009) extraordinary Korean vamp movie. 9 - Underworld: Rise of the Lycans (2009) Elite sophisticated vampires vs. beastly werewolves. 11 - Near Dark (1987) the only good movie Kathryn Bigelow ever successfully directed. 12 - Buffy the Vampire Slayer (1992) Pee Wee Herman is a Vampire! 14 - From Dusk Til Dawn (1996) Robert Rodriguez directs a compelling vampire story about 2 bank robbers who kidnap a family and take them to Mexico where they meet a hive of vampire creatures. George Clooney and Harvey Keitel star in this great piece of horror. 13 - Blood: The Last Vampire (2000) Japanese live-action film based on the anime. 15 - Shadow of the Vampire (2000) about the filming of Nosferatu. 16 - Salem's Lot (1979) based on the Stephen King novel. 22 - Dracula (1979) Frank Langella, eerie Gothic setting. 23 - Twilight (2008) the least favorite among vampire aficionados, but this movie does have a few scenes with merit. Maybe the acting is bad, the screenplay abysmal, but a the final fight scene is worthy. 24 - Monster Squad (1987) teens band together to save their town from the Universal Monsters. 25 - Interview with the Vampire (1994) Tom Cruise, Brad Pitt, Christian Slater. Are you feeling the need for a garlic necklace yet? Now you've got plenty to watch for your Halloween movie marathon, or any horror film double feature. Werewolves and vampires will always inspire new movies to come. I just hope the vampires get out of high school before the movie starts filming.